As the years go by, I’ve noticed how life actually seems to get more complicated each year. If I don’t make myself take a moment things can really amp up. Inside and out. 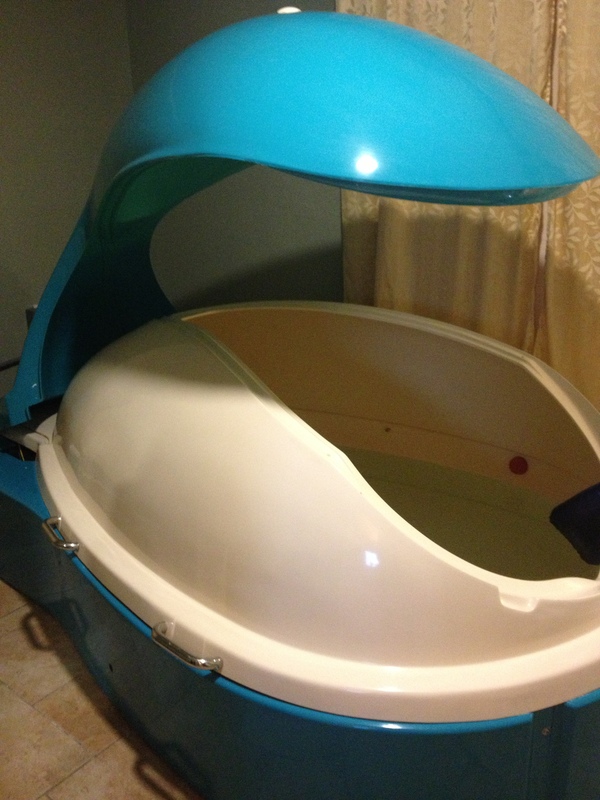 Recently I encountered a Groupon for The Float Shoppe, so I thought I’d give it a whirl. The floating experience goes a little something like this: You are assigned an open salt water pool (for the claustrophobic) or a closable “pod” (for the more daring, see picture below) where, once you are afloat inside (you get an inflatable pillow), there will be no light, no sounds (because you have earplugs in), and the feeling of weightlessness (or slight awkwardness, as you are floating naked in the dark in a saltwater pod). After I got over the awkwardness, allowed my mind to settle (STOP with the THINKING all the time! ), it was super relaxing. Funny how it took booking and paying for “quiet time” to actually unwind. Now you don’t have to submerge yourself in a float tank to relax, but perhaps a regular yoga class, a meditation practice, or even a hot bath regularly can help get you back to neutral. Very interesting. Never heard of till now. yeah, it’s not everyday you get to have an entirely new/foreign experience. not sure i’d pay full price for it, but a lot of people in the waiting room swore it was how they kept back pain, migraines, stress away.